When I tried it out it myself, it was fun and rewarding, In May, Trkaj, Jacuzzy and our neighborhood Savska held a festival Blok Party, which attracted a lot of people. We were there, live-tweeting about it. We've also asked other Twitterers (thanks @loudandwicked! ), who attended the festival, to use and amplify the same hashtag #savska, and in the end, more than 10 people tweeted about the event, producing over 50 tweets, most of them with pictures. Which isn't that bad on the Slovenian scale. My friend @jakasibicekaka did something similar, asking Trbovlje town councillors to tweet about a meeting with the #sejaOStrb hashtag, which attracted other people to participate as well (here's his blog post about it, in Slovene). Great results enabled by collaboration of many users. It can work on a small scale. What about the major league, it should be even better? Let's analyze two nation-wide events that happened this week in Slovenia. The first case mentioned was the Slovenia vs. USA friendly soccer match. 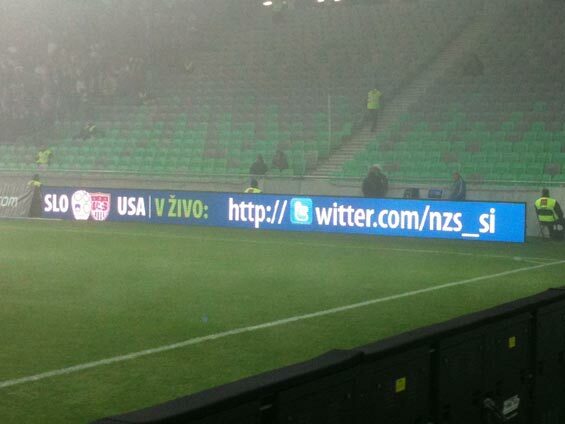 At the stadium, the National soccer association (@nzs_si) promoted their Twitter account which does live coverage of matches. Which they did. But that doesn't mean they did the whole Twitter thing right. They forgot about the extremely witty journalist @IEBergant also tweeting about the match. They forgot about me, and they forgot about you and 8 other thousand people watching the game live, probably quite a few geeks included. While NZS used the hashtag #fuzbal (slang for soccer), some used the hashtag #nogomet (soccer), #slovenia, #slovenija, and the mentioned Igor Evgen Bergant used #soccerSI-US. The results: a scattered pool of tweets which didn't really offer users the complete picture. The event went mostly unnoticed on Twitter. The results were amazing. Hundreds, if not thousands of tweets all over place. Local trending topic. They owned the Slovenian Twitterverse like no one else before them. It worked like a charm. You can check out the partial report (which only displays 100 of #soocenje tweets, happening in 5 minutes!) 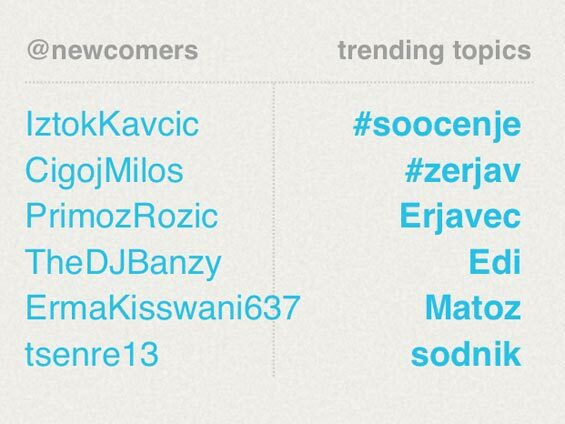 on the following link or use the #soocenje Twitter search, if tweets are still available. 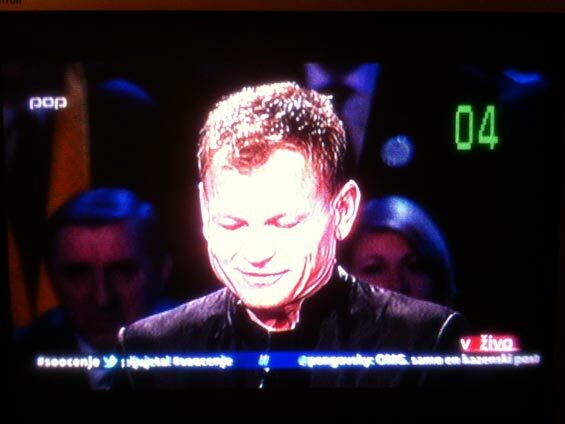 Epic stuff, moving the Slovenian media sphere a few years forward. I'm only a level 26 27 social media ninja, but I know a few things. If you're organizing an event, the most important thing is: promote Twitter hashtags, not profiles. Even if they are nothing more than just clickable search queries, they simply work. Search Twitter in real-time and look for people who are talking about the event. Ask them and other people attending to amplify and use the same hashtag. Thank them if they do. Most of them will join you, since it'll make it more interesting for them too. Offer something more if you can (like displaying tweets on a website). Use multiple accounts (official, personal) with different wibes. Upload pictures. Retweet. Interact. Have fun. Twitter, a funny service proving that a collective effort of many people will always provide a way more interesting picture than a single person can. More objective, more diversified, more everything. Perhaps even better than the original event itself. Real players are fully aware of that. Don't worry, even if you don't have the same power, publicity and followers, you can compensate with additional energy, time and mobile bandwidth. The results can be surprising. And if it does work, I promise you'll enjoy every little bit of it. UPDATE (22.11.2011): I got contacted by @24ur, who told me this was already their second Soočenje show (I missed the first one - the irony - playing soccer), and the first one generated over 1800 #soocenje tweets. I also got feedback from @nzs_si and @IEBergant, they've agreed we should make a joint effort the next time Slovenia plays soccer, also involving the biggest Slovenian soccer portal Nogomania. Awesome stuff. UPDATE (25.11.2011): Pop TV is on fire. Today, they've added another medium to support Soočenje on Twitter, their news portal 24ur.com, which is the most visited site in Slovenia. Forget Facebook. Šport TV and their billboards found Twitter, with style. Check out this billboard. Looks like Twitter is finally cool enough to be given a chance. Twitter just might be making the biggest mistake in its history.